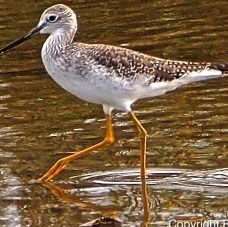 American shorebird. Adults have long yellow legs and a long, thin, dark bill which has a slight upward curve and is longer than the head. The body is grey-brown on top and white underneath; the neck and breast are streaked with dark brown. The rump is white. It ranges in length from 29 to 40 cm (11 to 16 in) and in weight from 111 to 250 g (3.9 to 8.8 oz). At ponds and tidal creeks, this trim and elegant wader draws attention to itself by bobbing its head and calling loudly when an observer approaches. 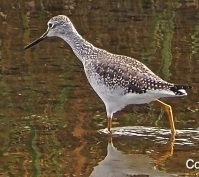 In migration, the Greater Yellowlegs are common from coast to coast. Sometimes it may annoy the birder by spooking the other shorebirds with its alarm calls; but usually it is a pleasure to watch as it feeds actively in the shallows, running about on trademark yellow legs. wooded muskeg, and spruce bogs. During migration and winter, they are found in a wide variety of settings, including tidal flats, estuaries, open beaches, salt and fresh marshes, shores of lakes and ponds, and on riverbanks. 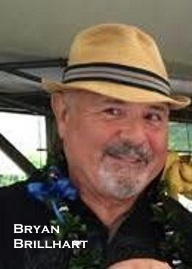 They breed in boggy, marshy places within northern coniferous forest. They typically forage in shallow water, often feeding very actively, sometimes running after minnows. They may forage by walking forward while swinging its head back and forth with the tip of the bill in the water. Diet includes insects and small fish. In breeding season, they probably feed mostly on insects and their larvae. In migration and winter, they often feed on small fishes such as killifish, and minnows. Diet also includes crustaceans, snails, tadpoles, marine worms, and sometimes berries. On breeding grounds, males perform display flights, alternately rising and falling with flutters and glides as it gives a loud, ringing, whistled song. Nest sites are on ground, usually close to water, often placed close to log or other object. Nests are well concealed in a hummock of moss, a shallow depression lined sparsely with grass or leaves. After mating, females lay usually 4 buff, blotched with gray and dark brown eggs. Incubation is probably by both parents in about 23 days. Downy young are able to leave their nest soon after hatching. Both parents tend young, and protest noisily with attacks or distraction displays if predators or humans come anywhere near. Young find all their own food. Age at first flight is probably in about 18-20 days. 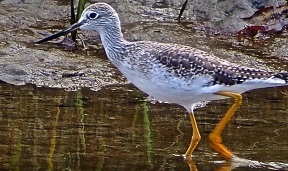 Greater yellowlegs are commonly found in our own Tijuana Estuary during the fall and winter months. Look for this seasonal visitor in upcoming months while enjoying a walk along the Tijuana River there. Until next week, happy birding!